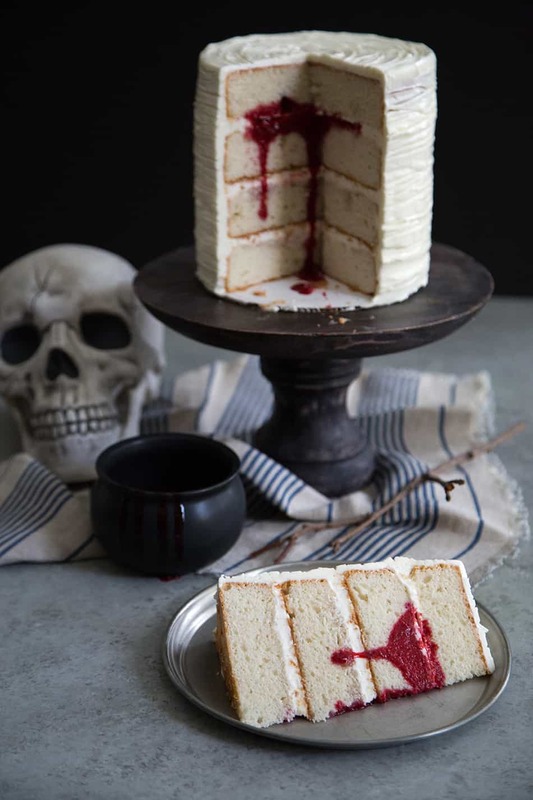 This surprise bloody cake will definitely shock your Halloween guests! It’s a four layer vanilla cake with Swiss buttercream and raspberry coulis. I don’t handle surprises very well. No surprise parties, no deviating from the itinerary, nothing out of the ordinary, please. When it comes to Halloween tricks, I am the absolute worst person to play a gag on. I don’t like things jumping to scare me. I don’t want fake spiders falling from above. Please hide the creepy clowns, zombies, and everything else that comes out at night. Maybe I am the perfect person to scare. I’m a sure thing when it comes to getting scared. I will scream. I will jump. I will give you the reaction that you are looking for. However, I will also get angry. It’s likely that I might cry. And after my breathing returns to normal, I will hate you and I won’t share any of my Halloween cakes, candies, and cocktails with you, including this surprise bloody cake. This surprise bloody cake is the extent of surprises I can handle. From the outside it looks like an unassuming cake. But once you slice into it, BLOOD! Raspberry coulis gushes out and drips all over the inside of the cake. I used the vanilla cake from this strawberry vanilla cake from last year. It’s a flavorful cake that is fairly dense and sturdy- making it perfect for stacking. 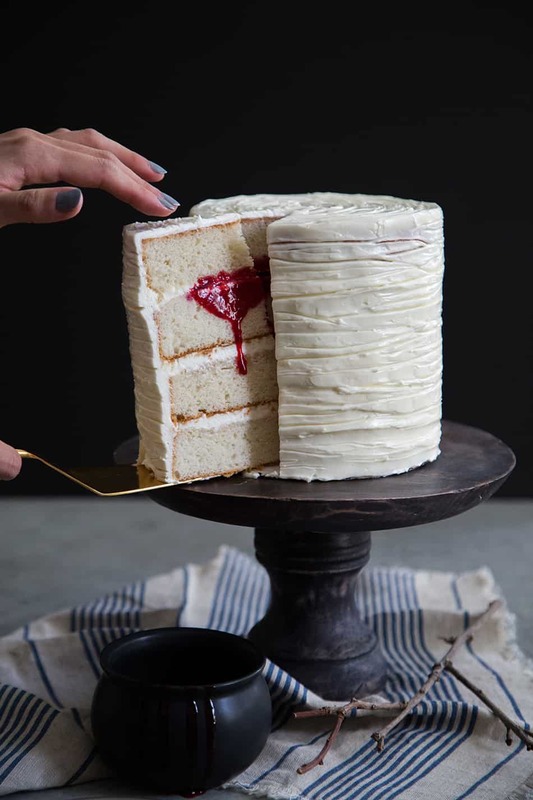 Each vanilla cake layer is brushed with a boozy raspberry simple syrup to keep the cake soft and moist. I spiked the simple syrup with Chambord (raspberry liqueur). The third layer of cake contains the surprise blood! I made a quick raspberry coulis to mimic blood. “Coulis” is simply a fancy French word that means strained fruit puree. It is deceptively simple to make and it can elevate any dessert. It’s perfect for topping ice cream, lava cake, cheesecake, panna cotta, etc. Here’s to a happy Halloween without any tricks, scares, and/or pranks. Let’s just all be nice to each other and hand out lots and lots of treats. I know the chances are slim… but hey, I can hope! 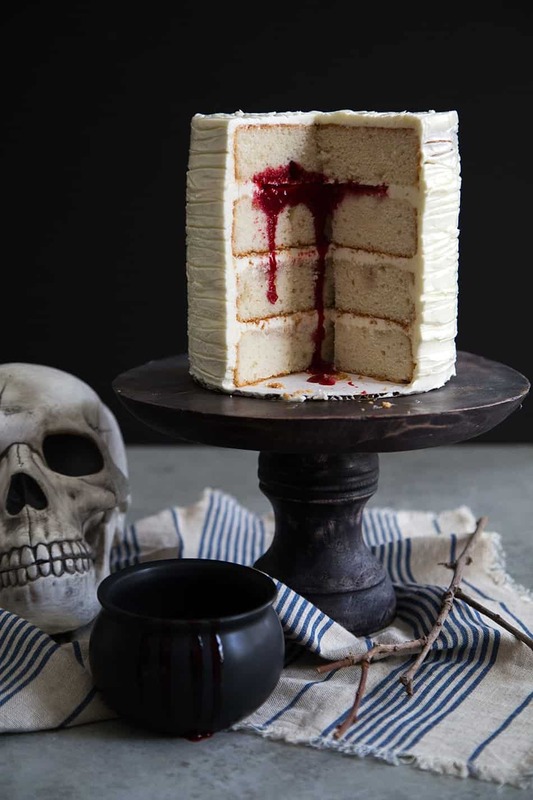 This surprise bloody cake will definitely shock your Halloween guests! It's a four layer vanilla cake with Swiss buttercream and raspberry coulis. Preheat oven to 350 degrees F. Butter and lightly flour four 6-inch cake pans. Line bottom with parchment paper and set aside. Add 1/3 of the dry ingredients. Mix on low speed while adding 1/2 of the liquid ingredients. Add another 1/3 of dry, follow with remaining liquid ingredients, and end with remaining dry ingredients. Mix until batter is evenly combined. Divide batter among prepared cake pans. Bake 30-35 minutes until toothpick inserted in center of cake comes out clean. Let cake cool in pan for 5 minutes before unmolding. Allow cake to cool to room temperature on wire racks. 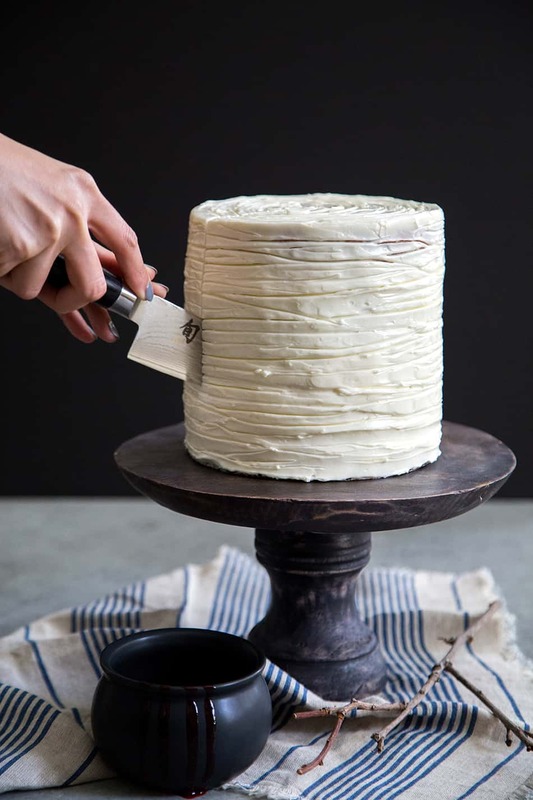 Once cake is cool, use a serrated knife to level off cake layers if necessary. In the bowl of stand mixer, whisk together egg whites and sugar. Place bowl over a pot of simmering water to create a double boiler. Make sure simmering water does not touch the bottom of the bowl. Whisk sugar egg mixture until it reaches a temperature of 160 degrees F.
Alternatively, if you don't have a thermometer, heat until all the sugar has melted. You can test this by dipped your pointer finger into the warm mixture and rubbing it against your thumb. The mixture should be smooth. You should not be able to feel the granules of sugar. Return bowl to the stand mixer. With the whisk attachment, beat mixture at medium speed until it has cooled to room temperature. Reduce speed to low and add butter one tablespoon at a time. Once all the butter has been incorporated, add pinch of salt. Increase speed to medium-high and continue to beat until buttercream is light and fluffy. In a medium sauce pot, add frozen raspberries, sugar, lemon juice, and lemon zest. Cook over medium heat until sugar has melted, raspberries have thawed, and mixture has slightly thickened. Stir occasionally to prevent raspberry sauce from burning along the sides of the pot. Remove from heat. Strain out raspberry seeds. Keep raspberry coulis (sauce) in the fridge until ready to use. Place one cake layer on a serving platter or cake turntable. Generously brush raspberry simple syrup over cake. Spread a thin layer of buttercream on cake. 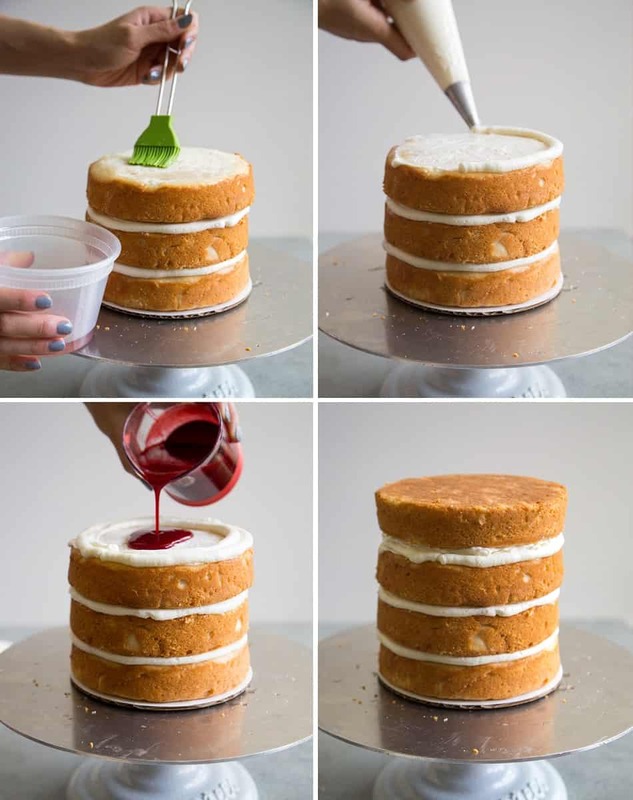 Place another cake layer and repeat adding simple syrup and buttercream. Place third cake layer on top. Brush with simple syrup. Spread a very thin layer of buttercream on cake. Using a piping bag fitted with a small round tip to pipe a buttercream border along the edges of the cake. Gently pour raspberry coulis into the piped ring of buttercream. Reserve remaining raspberry coulis for serving. Spread a very thin layer of buttercream over the last cake layer. Invert cake layer and place frosted side on top of cake to cover raspberry coulis. Spread a layer of buttercream around the sides of the cake to seal in the crumbs (crumb coat). Place int he fridge and allow to chill for 15 minutes to set the buttercream. Add another thin layer of buttercream. While the turntable to rotating, use a toothpick to drag lines around the cake. Keep cake stored in the fridge until ready to serve. Allow cake to come to room temperature before serving. Once you slice into cake, the raspberry coulis will ooze out. Serve cake slices with reserved raspberry coulis. Simple Syrup: Bring to a boil equal parts water and sugar. Remove from heat and allow to cool. Keep chilled. Store covered in fridge for up to 2 weeks. This is such a great idea, your cake looks amazing! Hi there , love this. Would you like to share this with the other participants in Food on Friday over at Carole’s Chatter? I have a weekly link up party – each week there is a different ingredient or theme. The current theme is Holiday Treats. You have outdone yourself with this cake! What an awesome dessert idea for a Halloween party. This is such an AWESOME idea!! 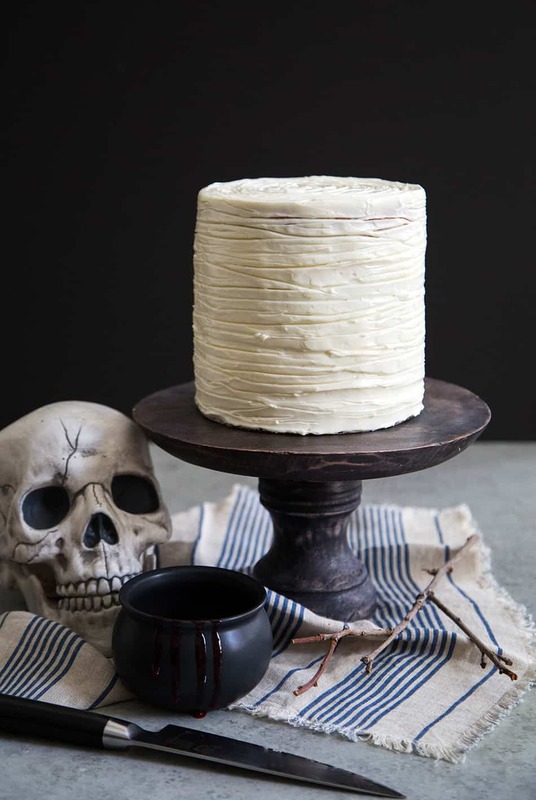 I want to throw a Halloween party just so I can make this cake. I can’t get over this cake! It’s FABULOUS!!!! Love that this cake is so classic on the outside but little does anyone know what awaits them upon first cut! Oh my gracious! This may be the coolest Halloween cake I’ve ever seen. I love the surprise factor when cutting into that pretty cake. AWESOME! I absolutely love this cake! And I must admit, I often like a little surprise…especially if it’s to my boys’ delight. I can only imagine what it looks like when it’s first sliced in to…the “blood” oozing down. Amazing! Can you use strawberry instead of raspberry? I haven’t tested this recipe with strawberries, but I’m sure it would work.